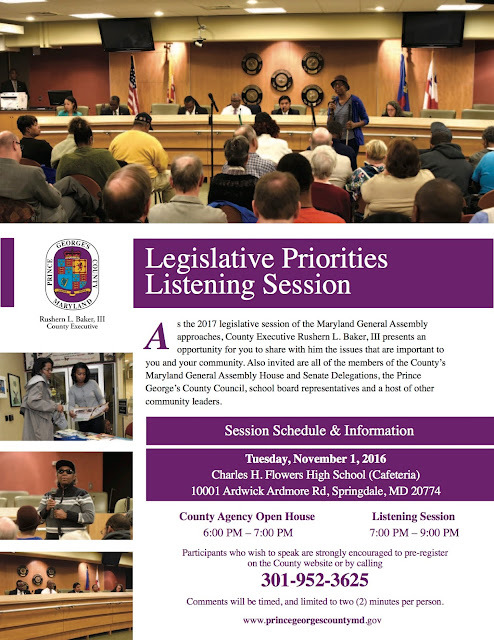 Prince George’s County Executive Rushern L. Baker, III, invites residents to attend his annual Legislative Listening Session on Tuesday evening, November 1, 2016 at Charles H. Flowers High School, 10001 Ardwick Ardmore Road, Springdale, MD 20774. Prior to the meeting there will be a County-wide department and agency “open house” beginning at 6:00 p.m. and the legislative listening session will begin at 7:00 p.m. This Legislative Listening Session will provide residents with an opportunity to share their ideas on issues that impact their lives with members of the County's Maryland General Assembly House and Senate Delegations, the Prince George's County Council, Prince George’s County Board of Education and other community leaders. Before the public meeting, residents will have an opportunity to talk with County agency representatives during an information session beginning at 6:00 PM. In addition, our one-stop resource CountyClick 3-1-1will be available to assist residents who may have questions or need help resolving non-emergency issues. Specialists will be present to submit service requests on behalf of residents and citizens. Please visit the Legislative Listening Session webpage to learn more about the listening sessions. Citizens can pre-register online by completing the registration form or by calling 301-952-3625. There will be limited opportunities to sign-up to speak; pre-registration is encouraged. Comments will be timed and limited to two minutes per person. If you wish to submit comments and are unable to attend in person, please email them. The location and time of the County-wide session is below. In addition, here is a link to the flyer that we encourage you to share with your friends, neighbors and relatives. If you are unable to attend, the session will be streamed. Check the County website on the day of the event for more information about watching the streamed session. Agency Open House 6:00 p.m. – 7:00 p.m. Listening Session: 7:00 p.m. – 9:00 p.m. Note : Before the public meeting, residents will have an opportunity to talk with County agency representatives during an information session beginning at 6:00 p.m.
Colder temperatures are in our forecast. The Prince George’s County Fire/Emergency Medical Services (EMS) Department (PGFD) is reminding everyone that home fires and incidents involving carbon monoxide (CO) are more prevalent in cold weather than in any other time of the year. This is due in part to an increase to people staying warm in their homes and in cooking and heating fires. This reminder involves the safe use of space heaters and general heating safety tips. Before the really cold winter weather arrives, NOW is a good time to call a heating, ventilation and are conditioning (HVAC) technician to check your furnace and ventilation system to ensure they are in good working order. This check-up will make sure the proper combustion is taking place and the by product of combustion, carbon monoxide(CO) is being properly ventilated to the exterior atmosphere. “Temperatures drop and fires increase,” said Prince George's County Fire Chief Marc S. Bashoor. According to National Fire Protection Association (NFPA) statistics space heaters account for about one third of the home heating fires yet more than 80 percent of the home heating fire deaths. The Winter Residential Building Fires report released by United States Fire Administration (USFA), reports an estimated 108,400 winter residential building fires occur annually in the United States, resulting in an estimated average of 945 deaths, 3,825 injuries, and $1.7 billion in property loss. Cooking and heating are the top causes of fires during cold weather. A working CO detector will protect you and your family from deadly "silent killer" fumes that may be building up in your home. County Law currently requires a working CO detector on every level of your home if you use a gas service, have a fireplace or an attached garage. All apartments, dorms, motels and hotels are also required to maintain working CO detectors. Install smoke alarms on every level of your home including just outside of sleeping areas. The Fire/EMS Department also recommends a working smoke alarm in every bedroom and to sleep with your bedroom door closed. Everyone should replace older battery powered smoke and CO alarms with a newer 10-year alarm that does not require a change in batteries. Residents are encouraged to utilize Prince George’s County’s County 311 system to obtain information about public services and obtaining a smoke alarm installed in your home, free of charge.